So the question goes like this, suppose one can purchase a bottle of beer with 2 bucks (or any unit of cash). Then this person can choose to recycle the bottle and caps for new bottles. For every 2 bottles, or 4 caps, a new bottle of new beer is given. With all these information in mind, how many bottles of beer can one consumes if this person has 20 bucks. Then I gave up and tried writing a simple program to solve the problem (the reason why I used logging instead of print). With the help from this snippet of code, the answer to the question is found to be 35. So the cost of each of them is slightly over 1 buck. 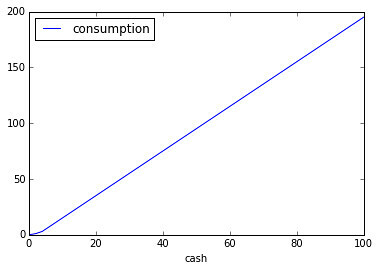 Out of curiousity, I wrote this to figure out the relationship between available cash and number of bottles. I didn’t make it a Panda Dataframe for no reason, it was mainly for this. I was quite surprised to find out the data looked quite linear (in fact it is 2x - 5) except for the first couple of points. So, after all these done, the conclusion is, in this fictional world, as long as you have enough cash, you can enjoy beer at almost half the price (if you don’t mind the extra effort, that is).